A 2½ mile circular walk from Waterloo Station featuring the Blake Mosaics and St Thomas' Hospital. It does include some rather grotty thoroughfares! Begin on the upper level of Waterloo Station. For the bicentenary of the Battle of Waterloo a new war memorial to honour the 24,000 soldiers of the Anglo-Allied and Prussian forces who were injured, died or went missing was unveiled by the present Duke of Wellington in 2015. The centrepiece is a giant replica of the Waterloo Campaign medal, depicting Nike, the Greek Goddess of Victory. It also features a tribute to the fallen soldiers by the Iron Duke: My heart is broken by the terrible loss I have sustained in my old friends and companions and my poor soldiers. Believe me, nothing except a battle lost can be half so melancholy as a battle won. There is also a stained glass coat of arms of the SW Railway with places served carved in stone which was above a station exit. The Victory or Memorial Arch was built 1919-22. Bronze plaques bear the names of 585 LSWR employees who lost their lives in WWI. Outside are two sculptural groups, one dedicated to Bellona and dated 1914 and the other, dated 1918, to Peace. An inscription around the window between them reads 'Dedicated to the employees of the company who fell in the war'. Above are the names of the greatest fields of battle and below a clock in a sunburst. Britannia is at the top of the building. The sculptor was the other wise little known Charles Whiffen. South Bank Mosaics have premises in the crypt and a number of works in the church garden. Return to the station and go long York Road. Just past Chichley Street go left along Leake Street which becomes a tunnel under the railway. There are more Blake mosaics along these streets. Right at Hercules Road then right along Lambeth Road. Enter Archbishop's Park on the right. Take the path ahead edged with red bricks. This Millenium Path features events from Lambeth's history. Bear left towards the children's playground. Continue along the path and exit into Lambeth Palace Road. Cross and go left. Enter the grounds of St Thomas' Hospital on the right. The Tree of Life sculpture by Chris Plowman (2005) with laser cut leaves and birds in steel represents growth, regeneration and hope. The corridor that runs through this and the north wing is lined with hand painted tiles by Doultons depicting children's fairytales and nursery rhymes. They were made for the children's wards c1900, relocated in 1968 and restored in 2008. At the north end of the south wing is a mini museum and pharmacy display. There are statues of Florence Nightingale (1958), Queen Victoria (1873) and Edward VI (1739). St Thomas' history is depicted in a textile work (2008) by Natasha Kerr. The stained glass is Window on Life (2000) by Carole Nunes and Dr Jim Cohen. On the first floor is the grade II listed hospital chapel. Memorials in the chapel remember people who have played important roles in the hospitals history, including: the terracotta triptych above the altar to Sir Henry Doulton, the Good Samaritan relief by George Tinworth in memory of Sarah Wardroper, matron of St Thomas for 33 years, a statue of St Thomas Becket after whom the original hospital at London Bridge was named, a memorial to the nurses and junior medical officers who died in the discharge of their duties and a memorial to Florence Nightingale who established the Nightingale Training School at St Thomas. This was designed by Robin Williams in 2000. It features a glass aquasphere by Alison Armour. On the left is a bomb damaged section of the hospital. The statue is Sir Robert Clayton, Lord Mayor of London and President of St Thomas' 1692-1707. The marble work of 1702 is by Grinling Gibbons, more noted for his wood carving. Walk right along the riverfront to the Fountain Garden. Looking towards the hospital entrance the two figures on the bridge are Cross the Divide (2000) by Rick Kirby and there is a small statue of King Edward VI who re-opened the hospital in 1551 by the entrance. 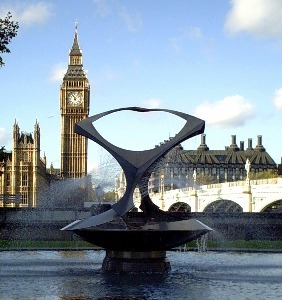 The fountain is Revolving Torsion (1972) by Naum Gabo on loan from the Tate Gallery. There is a new statue of Mary Seacole by Martin Jennings (2016). The bronze disc behind it bears an impression of the ground taken from the site in Crimea where the Jamacian nurse ministered to British soldiers during the war of 1853-6. There is a quote from Times war correspondent William Russell. On the bridge is a large lion statue made of Coade Stone and designed by WF Woodington. This was originally red and displayed on the Red Lion Brewery building, demolished for the Royal Festival Hall. The London Eye was designed by Julia Barfield and David Marks and opened in 2000. There is a statue group to the International Brigade by Ian Walters to the 526 killed in the Spanish Civil War from Britain and Ireland. Jubilee Oracle is by Alexander (1980). There are ornate lamps entwined with dolphins. The original ones, designed by John Vulliamy, were only on the Victoria Embankment. Copies were made for the south bank for the Queen's Silver Jubilee in 1977. The colourful and odd-shaped benches are by Danish artist Jeppe Hein. There is a bust of Nelson Mandela by Ian Walters. Topolskis Memoir of the Century, a 600' artwork that presents a panoramic record of the twentieth century is within a bar and cafe.